"Hocus" was a Pelican dropship pilot in the UNSC Navy during the Battle of Earth. Hocus was the pilot of Pelican dropship Kilo 023. She assisted in extracting SPARTAN John-117 and Sergeant Major Avery Johnson, along with a squad of liberated Marines, from the jungle near Mount Kilimanjaro. 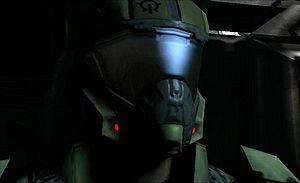 Following the Covenant attack on Crow's Nest, Hocus was instrumental in evacuating the rest of the survivors of the attack to the human frigate UNSC Forward Unto Dawn. She participated in numerous ground insertions during the Battle of Installation 00, such as deactivating the shield barriers surrounding the Ark's Control Room. Hocus has a similar role of Foe Hammer, the principal Pelican pilot in Halo: Combat Evolved. Her voice acting and personality are probably an indirect reference to the character by Bungie. On the level Crow's Nest, you can see Hocus' face when she picks up the Marines after the Jump Pack Brutes are killed, by jumping on the front of the Pelican. However, she tends to have a completely different face from time to time, so it is unknown what she really looks like. The character is voiced by Debra Wilson, of MadTV fame. Hocus has the standard Marine pilot character model when seen flying her Pelican, which, strangely, is a male marine body.